Mumbai, 7th November 2014: Many exciting career opportunities will become available to science graduates from India as the country aims to become the sixth largest scientific power-house, according to a leading Sydney academic. 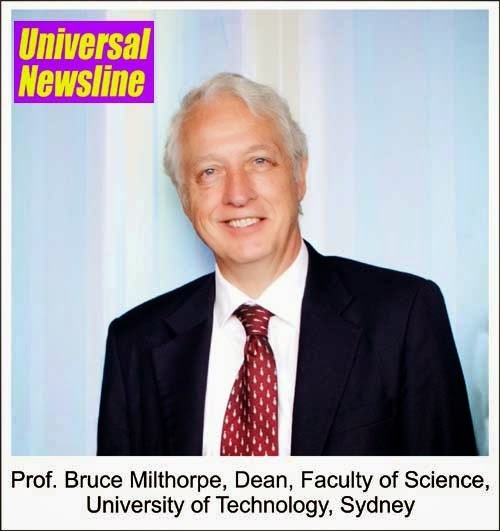 Professor Bruce Milthorpe, Dean of the Faculty of Science at the University of Technology, Sydney (UTS) in Australia, is visiting India to highlight the range of careers in science. “It’s clear that graduates in engineering and IT are already in high demand right now, but Indian students should also be excited about the government’s plans for 2017 to create more than 100,000 additional positions for researchers and scientists,” Professor Milthorpe said. “I’ve been a scientist for more than 30 years and I have never ceased to be amazed and excited by the innovations and knowledge discovered through science. If you are a student who is intelligent, curious, creative and have an aptitude for mathematics, choosing science may be the most exciting and rewarding thing you can do,” he said. Today, scientists are employed all around the world, with 40 per cent of Indian science graduates working internationally, but the demand locally is predicted to rise. Professor Milthorpe suggests students prepare for an international career by becoming a higher education, undergraduate or postgraduate student in Australia. “Sydney is a desirable destination for students to gain a quality, international education while studying in a very safe and enjoyable city,” he said. Professor Milthorpe advises Indian students aiming for a career in science, technology, engineering or mathematics to consider studying at UTS to capitalise on the growing scientific links between Australia and India. “Austrade has been expanding the connections in research and development, technology transfer and commercialisation between the two countries, demonstrated by last month’s Australian Innovation Showcase in India,” said Professor Milthorpe. These events highlighted scientific and business collaboration between Australia and India in areas as diverse as nano-biotechnology research, biofuel, solar research, automotive components and food production improvements. “The skills gained in studying science, such as analysis, critical thinking, communication and project management will ensure Indian science graduates are well regarded by employers throughout their careers, whether seeking a role in research, government, education, business or creating entrepreneurial endeavours,” said Professor Milthorpe. Many international students choose to go to UTS by enrolling in the premium pathway college at UTS:INSEARCH in Sydney. Over the past five years, more than 300 students from India have commenced their studies this way, studying the UTS Foundation Studies program, or a diploma which qualify them to enter UTS courses in architecture, business, communications, design, engineering, IT, science and health science.